Campechano is always a hometown favorite. The weekend didn’t turn out quite the way we planned. On second thought it may have turned out exactly as we planned which was to be able to find a mechanic for the pump and with a little luck get it back on the boat and working by Monday. 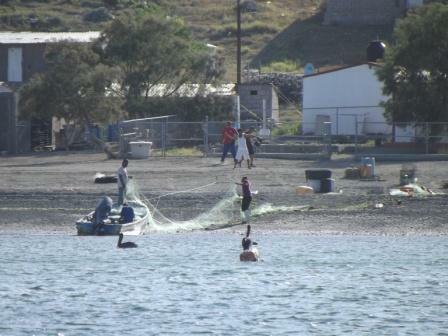 Today being Sunday we can tell you that Hugo the mechanic who we borrowed from a Sardine Seiner here on the docks of San Carlos thought that he would have the pump back on the boat today. He and three of his amigos came on board the boat yesterday after a pretty fun ride out in the dinghy. Hugo is pushing 300 lbs. I am a cool 200 and his two amigos cast up about 150 lbs each so the dinghy was heavy. Because of the late start the waves were up and we did everything we could to keep from being overwhelmed by the 2 foot chop. Once the boys were on board Bill showed Hugo the schematic of the pump and he quickly ascertained that because of the difficulty in removing the pump pulley and some tell tale signs of “Hammer Damage” on the shaft that the porcelain seal was most likely cracked or broken when the pulley was installed in Mazatlan. Bill was able to attest to the fact that the mechanic did take a soft hammer to the pulley on installation, heck; he probably would have taken a big hammer if he had had trouble with the pulley, but then again he is just a glorified fork lift driver. This morning we met with Hugo as he was back on the Sardine boat and he showed us the bad news via some cell phone pictures which precluded him from returning the pump today. Although neither Bill or Lisa can really see without glasses, the pictures, arm gestures and facial features on Hugo explained that the shaft was damaged by the cracked seal and there was some other damage that looked to have been caused to the main pump housing by something, all was “muy mal” according to Hugo but in an instant he changed his face and said that he would have the pump back to us tomorrow afternoon. Apparently Sardinina’s work on Sunday but the machinists and parts specialists don’t and the shaft needs to be milled or touched up prior to installing the new seal. So we have set a meeting for tomorrow at 3 PM. 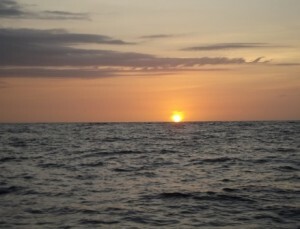 With any luck that time will be firm and it will still give us a chance to leave Magdalena Bay before the sun goes down. The town of San Carlos could not be more charming to us. There is one main paved road, many nice restaurants or perhaps we should say small, clean and cute mom and pop restaurants, helpful people and friendly towns folk. 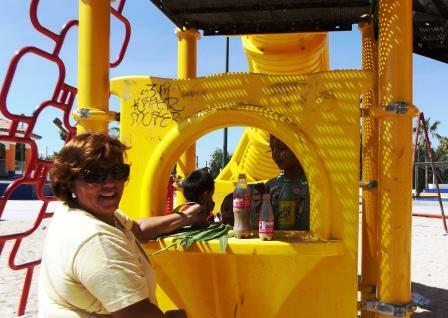 Lisa spent a bit of time with the children in the park and probably made their day when she purchased a bag of chips and two sodas from a group of kids who were pretending they had a Tienda selling sodas and the like. Of course the soda they were selling were old pop bottles filled with sand and some empty chip wrappers that were filled with sand as well. I think she spent 1.5 peso’s for our snacks but the kids were smiling just the same as they counted their loot. The town does boast two or three expensive restaurants as well. During a rare Bill and Lisa tiff, Bill took the opportunity to drop off laundry and duck into one them (The Alcatraz Hotel) for a soda. 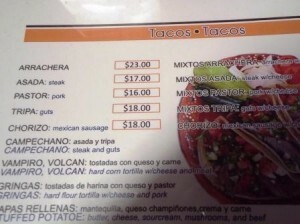 He and Lisa had planned to visit the restaurant later in the day but after viewing the prices ($120 pesos for 3 fish tacos), he decided to do his dinning elsewhere (upgraded to Shrimp tacos and a beer for $80 pesos). The ambiance at Alcatraz was very nice and he is sure that dinner would have been splendid but after blowing $300.00 U.S. on the pump rebuild (pay in advance and hope) we are watching our ducats just a bit more. Tomorrow we have most of the day to ourselves. This area really could use about two weeks of exploration but we are on a bit of a schedule, i.e. when the weather says go, we need to scoot, so we will do a whirl wind trip around the local beaches in the dink and get Sparky a bit worn out prior to our departure around sundown. There is really nothing we can do until the pump is in. The rest of the work is putting the dink up and tying it down. After that we light the fires, kick the tires and hope to goodness sake that we have been good all year and somebody wants us to make Turtle Bay by Thursday. Time will tell, luck is usually standing close to us but never wants to let into whose side he is on till the end. One last quickie thing. 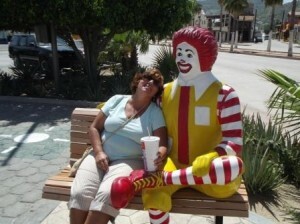 In the last two days Lisa and Bill have been wandering the streets of San Carlos. Apparently Americans are a bit of a rarity around these parts. Twice in two days we have asked some adult for directions in our best Spanish and when we spoke a child close to the people we have asked shouted out “Gringo!” They shout with the excitement of somebody yelling “Ice-cream”, “Ole’”, “Goal!”, “Mazzeltof” or even “Bingo” and it is always startling to Lisa but makes her giggle afterwards. Viva Mexico! It is fun to be noticed. “No, I’m not kidding, we are sinking, again”. It wasn’t the words that Bill had said that upset Lisa but rather the fact that we were turning around again after making 30 good miles since noon and 20 positive miles toward San Diego or Turtle Bay which was our ultimate destination. Our friends Bob and Sherry (B.S. to those that know them) are very dear to us. Sherry is the light of any get together and Bob is just one of those guys that are willing to do anything to help a person out. During our recent issue in Muertos where the alternator bearing failed, it was Bob that ran the telephone panel to disperse information to the appropriate people about the alternator and it was he that was willing to front money and rent a car if needed to get the parts to us. It was also Bob and Sherry that told us the day we traveled to Todo Santos with them that we could check out of the country but we were not leaving. It was no wonder they wanted to check out the Hotel California while there. We didn’t think much about their threat to our travels at the time but after the trouble with the Mexican Health Department, Port Captain and Alternator issues we are beginning to believe that they may be at the root of the conspiracy to actually keep us in Mexico. It might be fun to stay but there are a number of people in Mexico and California that would be disappointed. The water had been coming into the boat since we departed Puerto Magdalena or Man of War cove. Our intentions today were to get a good start on the trip to Turtle Bay and as suggested by our friends and the local weather guy, the weather would cooperate. 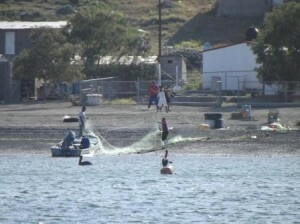 True to form, the weather was fine and our 6 hour trip up to Bahia Santa Maria was pleasant and comfortable. Only the nagging light on the bilge pump created a bit of distress or concern. When we first noticed it we figured it was just the added water in the bilge from pulling up the anchor. After the third time that we saw the light on the bilge pump come on we took a quick look in the bilge and didn’t notice anything odd so we chalked it up to the anti-siphon valve not working correctly and Bill went to work adjusting it and determining that the issue would stop. As we were pulling away from the last land mass we would see for 48 hours or more we decided that perhaps we should check into the bilge pump issue since it had again cycled on then off. Bill pulled the floor boards near the pump and determined that there was definitely water coming from the front of the boat so he pulled the floor boards at the front of the boat and determined there was no excess water there. He move back to the boards near the front of the engine and removed the settee to access the engine. This is when he informed Lisa that they were indeed sinking albeit at a slow enough rate that Lisa and a bucket could easily keep up with it till they reached their destination. Lisa needed some confirmation at this time and again Bill said, “No, I’m not kidding, we are sinking, again”. The only problem with having Lisa and the bucket keeping the boat dry was that the raw water pump that was just rebuilt in Mazatlan a couple of months ago was the source of the leak, and neither of us was willing to risk the pump disintegrating somewhere out on the open sea. After a fairly quick discussion we turned the boat around, shut down the engine and with fair winds and following seas we headed back to Man of War cove where we at least had some options for correcting the problem. We arrived safely at approximately 0130 this morning, are anchored and waiting for the morning sun to bring us new adventures in boat repair. We would have traveled in to San Carlos (the major industrial city here) but the channel is a twisting mass of lighted and unlit buoys so we figured we better wait till the morning. Additionally we have a Mexican friend here that may be able to help us locate the correct person to supply the needed bearings and bushings to correct the leaking pump. The good news at this point is that we are only aware of four late season hurricanes that have ever hit Magdalena Bay, there are two hurricane hiding holes in the area, we believe that since this is a commercial port we will be able to find the parts for the pump and they have unbelievable scallops here that we have found nowhere else in the Baja. The bad news is, we may miss a perfect weather window to skedaddle home, there is a potential hurricane forming today over Zihuatinajo Mexico, and it really would have been great to not have to continue to rebuild this boat while doing a return delivery to the states. 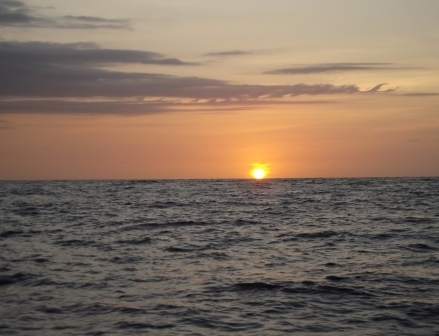 Cabo San Lucas to Magdalena Bay, the recap. We have had some time to rest now and thought we would give our report on the trip north from Cabo. This is supposed to be the best time of year for transit up the Baja coast. Even when it is not the best time the first stretch (what we just finished) is supposed to be the most benign. We picked our windows based on the expert opinions of both industrial and amateur endeavors and got pastes twice and then found something that we could at least get started in. All in all the trip was survivable and we are sure many others have worked through much worse. We are thankful we have a big heavy boat that makes even the worst weather bearable. The first of the three legs of this trip was OK. Winds were a bit high and the seas were not flat but other than that we encounter no problems and Lisa was able to make breakfast while underway without an issue. Just outside of North end of Cabo Falso the conditions moderated and the middle section of the trip ticked over like most any other overnight trip. We ate well, bobbed around a bit but generally made good progress. Actually our progress was about average for most voyages along this stretch and perhaps even a bit fast. The problem with fast is it set us up for passing Punta Tosca at noon which is in the “NO, No” time frame. We prepared for a rough bit of waves and wind and as usual got just a bit more than we thought we could handle. Bill says his friend Jesus does that to him all the time, testing. Jesus generally gives Bill just a bit more than he can handle comfortably to see if Bill will use his name in vain. As a bit of insight, Lisa has rarely heard Bill use Jesus’ name in vain but he does get in heated argument with the fella fairly often. Tosca has a number of issues that we as first timers didn’t realize. Number 1 is we miss read which piece of land was Tosca to begin with. This was not a navigational error but more of a “oh, it’s that other piece of land over there” type issue. What this lead to was us pulling away from the mainland before we actually wanted to which added to the amount of time we were stuck in the rough waves and wind. Had we stuck closer to land for another 10 miles we are certain our trip would have ended well before midnight last night. The second issue at Tosca is the tide and current. We had ridden the counter current up the coast most of the way. The typical direction of the current is from North to South, but by sticking to the shore we were able to find an eddy effect that either reduced the current to zero or gave us a bit of a shove up the coast. When we left the Baja coast early we found tidal current coming out of Mag bay that set us south, a current that naturally wanted to set us south, wind that was blowing from the North that set us south and waves that were travelling south that would just as soon roll us over as take us south. So after leaving the coast and traveling mainly west to get a good angle of sail for passing the point we found ourselves, well south, not good for going north. Of course the third issue with Tosca is the wind. Each of the points along the Baja have an increased wind factor (the Cape effect, look it up if you like) that accelerates the wind around the points by something like 10 to 15 knots. Punta Tosca is no exception and if the true wind was blowing 18 knots yesterday then the wind around the point was accelerated by almost 20 knots as we saw steady wind for a couple of hours of over 27 knots with a top gust of 32. Our only thankful area, in these winds, was that the swell was down so the wind waves on top of the normal swell produced average waves of 6 to 8 feet with the occasional sets coming in at 10 to 12 feet instead averages at 10 to 12 feet. If you have never had the occasion to be on a midsized sailboat in waves like this we suggest you check out the post that the Dude wrote back on 24 November 2012, the description is pretty accurate. So hitting Punta Tosca after noon is a proverbial ‘NO, NO’. Ultimately we spent the next 7 hours in increasing winds and waves and making progress at about 1 mile per hour, though we must have motor sailed nearly 30 miles in those 7 hours. We discussed options but on this coast the only true “cover” we could have gotten would have been back at Cabo or just drifting with the wind for a while then having to recover all the distance again. Lisa was having none of that so we plunged headlong into the seas with spray covering the boat at every wave, the bowsprit spearing itself into the larger surf every couple of minutes and regular visits by boarding waves on the quarter hour. This continued from 3 pm till nearly 7 pm when the winds finally dropped to about 23 knots and things began to settle down. Heck, dinner in those conditions came out of the galley as Meatloaf with veggies and rice, 23 knots aint that bad after 30. We hallucinated our way into Magdalena Bay. Bill had been up for almost 48 hours and Lisa wasn’t in much better shape. Arrival into Belcher Cove was something like, “Hey Bill should we really be dropping the anchor here, I think I see pilings right behind us”. “I’m not looking behind us Lisa, I am looking at you to tell me you have dropped 150’ of chain, are you done?” “What about the pilings?” “Lisa, I can hardly see the instruments in front of me, we will worry about pilings tomorrow, I am off to bed”. We left Cabo this morning. We felt better about staying in Cabo this time than the couple of times we have stopped there before. We think it is because we are now able to overlook the glitz and cheesiness of the local tourist area. 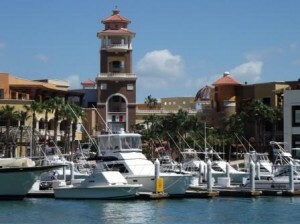 We know have the since to not trust the local marina representatives who say that everything is expensive in Cabo and according to at least one, you will spend more in $4 beers at the bar while looking for beer in a store that is cheaper than $38 per case. As a personal challenge to Bill he was able to find cases of Pacifico for around $20 without even breaking a sweat. Having committed most of the Captain Jim Elfers book, “the Baja Bash” to memory we took off today. The predictions were for great weather but even before we left we checked the wind in the anchorage. According to our new Baja Bible you can take the wind in the anchorage, add 10 to 15 knots to that and have the wind on the outside of Cabo Falso (our current nemesis). Since we added 10 to the roughly 6 to 8 knots we had inside the anchorage and couldn’t get it to add up to more than 30 knots we took our chances. According to the paid weather sites we should have seen 14 knots of wind with waves around 3 to 4 feet. What we got was wind in the high teens and low 20’s and sea to 4’. According to the Baja Bible we got what was expected and moved forward. In his book, Jim says that somewhere 10 to 20 miles from Cabo Falso we should start to see things settle in a bit. Almost to the mile we started to see calmer or more regular seas at about the 10 mile mark. The wind has dropped a bit this afternoon but not appreciably. Currently we are seeing mid to high teens, but the boat is accepting these and we are working them to our advantage with the sails. Tonight called for winds in the single digit. Neither of us are really believing that will come true, but you never know, we have broken a lot of chicken wish bones over the last couple of weeks. At least one of them should have worked. At the moment we have another 120 miles to go. At the present speed that would get us to Magdalena bay sometime around sunset tomorrow. We are hoping to pick up a bit of speed if the wind drops but are not counting on it. If it gets to late tomorrow, say 11 PM we will most likely keep trucking to Bahia Santa Maria which is another 20 miles up the coast. It will be our next stop after Magdalena most likely anyway, so our options are open. Hope your commute was a good one. Position 23 00 629 N by 110 08 678 W, waves 6 – 8 feet, wind approx 17 knots. All is well and we are moving at 3 to 4 knots directly to our destination of Magdelena Bay. Our ETA is sometime tomorrow afternoon. Our tracking program is on the other computer so we won’t be able to update that till we get into the next port or anchorage. Sorry. Message created at 1130 Cabo San Lucas time. We picked up a go signal today. One of Lisa’s favorite sayings is “Plans, written in the sand at low tide”. Our weather forecasting is a lot like that. Yesterday was a go until we got pushed back by unpredicted winds reaching 30 knots. When we returned to the boat the forecasters had changed their forecasts and everything we saw was nearing 20 knots along our entire route. We looked a little further and the plan looked to be for a Tuesday departure. Our friend who is pretty good at forecasting suggested that Thursday might actually be better but he would have a second look in the morning and discuss with us. Today everyone is pointing at Monday being the day to go, we will see. The trouble with getting out of Cabo aside, one of our biggest fears during this entire trip has been dragging the anchor. We have never dragged in any anchorage yet, but the nagging little fear is always there when the winds pipe up or we are away from the boat. There are times where it is hard to relax until we turn the last corner and see our masts still standing in the same place that we left them. When Lisa hollered down the companion way today you can imagine Bills fear as she said we were getting pretty close to a panga that was moored in the bay with us. Bill, ever the optimist, said there was no way we were moving and was sure our anchor had set well. We both watched as the wind played the two boats closer to each other then directed them away again. Finally it became evident that Beyond Reason was in fact very well stuck to the bottom and that the panga was floating out to sea. It wasn’t much of a rescue for Bill to jump in the dinghy and capture the wayward panga and tow it back to sea but it was a bit of a diversion from the day to day drum pounding at the beach clubs around the Cabo shore. Speaking of diversions we are taking a break today to run into town for some last minute supplies (Rum, eggs and butter). While we are in town we will be dropping by one of the Cinapolus Plaza’s here in town to catch a movie and have a bit of ice cream. Lisa is ever encouraging that the way to start a good trip is with ice cream… Enjoy your Sunday, tomorrow could be a tough commute. //WL2K Waves OK, wind not so much. We will try the Cabo rounding on another day. We departed today at just after 5 AM and found 30 knots out by Cabo Falso. 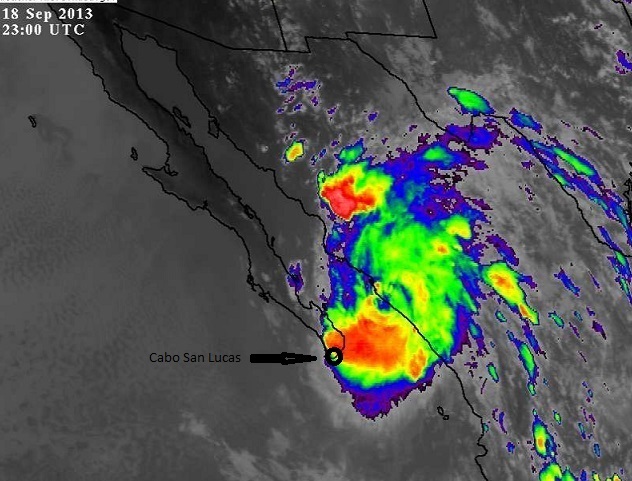 The seas were running in a nice pattern until we got perhaps 4 miles north of Cabo Falso then they started to build up. Learning from our last attempt we aborted early this morning and have returned to Cabo once again. Surprisingly it is only 9 AM and the breakfast dishes have already been put away and we are ready to start another enjoyable day hear on the edge of Paradise. According to our weather predictors we are looking at perhaps a Tuesday departure for version 3 of this rounding. $100 per night does not get you a room at the Hilton in downtown Portland but it would get you a pretty nice place to stay in say, Stockton California. $100 a night gets you parking in Cabo San Lucas for your boat. We are documented at 43 feet long so you might be able to park your truck and a 23’ trailer for that price if you had to, got to wonder what Wal-Mart charges? With the cost of berthing we checked out the price of hotel rooms and found we could have a hotel room with a double bed, air conditioning, internet, warm shower with pressure, and a continental breakfast for about $43.00 US. One would think the marina would provide at least some of these amenities for the $100 nightly price, not. We are staying at the IGY Marina here in Cabo San Lucas (Island Global Yachting). According to their documentation “Your distinctive yachting lifestyle is elevated here at Marina Cabo San Lucas where every aspect of a boater’s experience is provided for. Your vessel will be moored to a modern concrete dock with 24-hour marina security provided by a combination of guards, electronic key card access, and closed circuit TV, beside internet wireless access. Electricity is offered in either 110 (30 amps) or 220 (50 amps). Potable water is provided via a reverse osmosis system from the marina’s own 40,000-gallon-a-day desalination plant. Guests also enjoy access to cable television in-slip and wireless internet access. Shore-side amenities at Marina Cabo San Lucas additionally include a full-service chandlery, swimming pool and recreational area. First-class restrooms and showers, laundry facilities, storage lockers and parking are conveniently located in three complexes across the marina grounds” OK, perhaps they have some amenities here. We didn’t try the cable television, but at $38 US a case for beer we skipped over their chandlery. The swimming pool was a nice size for a marina but the grounds could have shown a bit more care. The lawn was a bit overgrown and the furniture could have been a little more inviting. The most notable positive aspect was their cockroach avoidance procedures. We stayed around the corner at the Pisces Marina last week and found cockroaches that bordered on our experience in San Felipe. Here at the IGY we witnessed the Cockroach eradication process and were impressed. To add more to the “distinctive lifestyle” provided for my $100 per night stay they do in fact have very clean restrooms. Of course where we are staying you still have to hike about 500 yards to find a bathroom or shower, but then we eat burritos all day so the exercise is nice. What I don’t appreciate is cold showers with no pressure, internet that does not function above that what we can steal from across the bay and prices that are way above those you will find in Los Angeles and San Francisco where dodging the barkers for Tee Shirts and fake Cuban cigars (which even if real don’t pose any threat to the cigars made in Nicaragua) is never a real problem but here in Mexico becomes a bit tiresome after your second day on the Malecon. The Port Captain here in Cabo San Lucas closed the gates on the bay so we had to come in or face a fine for remaining anchored while Manuel passed us by. This has cost us 3 days here in the marina but we guess it is the price you pay to be in Paradise. If you read the Dudes View you might start to recognize the conspiracy theory that Bill wrote about not so many months ago. Somebody has a Magic 8 ball here in Mexico and is watching over us to be sure they get every last peso that is coming to them, so we stayed. Of course when the crew of Beyond Reason stays anywhere we don’t just eat and shop from the boat, we find the Magic Money Machine and spend, spend, spend. We don’t doubt that the Mexican Parliament has written in an amendment that states that all Marina’s and cities apply the Magic 8 Ball to any chance of Beyond Reason leaving, in other word when we ask if we can leave tomorrow the probable answers is….”Your chances are highly Unlikely”…. We expect that we will be wrung out by Saturday and hope to leave for points North. If IGY has cooperated with us you will see this message before the 21st of September. Cross your fingers and pull out your Ouija board, cheat if you have to and get the pointer set to YES. Well the good news is that we are not in some remote anchorage between Cabo San Lucas and Puerto Escondido. Unfortunately we do have some friends that may be in that situation but we have faith that they will be taking shelter soon. Hurricane and Tropical Storm Manuel has been a tough one for forecasters. It started early in the week and has now worked itself up the western Mexican coast and done some pretty extensive damage south of Puerto Vallarta. The chaos should have stopped there according to the NHS (National Hurricane Service) but we knew better and decided we would stay put here in Cabo for a couple of more days. Turns out Manuel re-appeared in Puerto Vallarta as a Tropical Depression and was forecasted to fizzle out and just bring some rain to the areas north of there. My guess is tomorrow there will be new on Mazatlan getting hit with flash floods and other mayhem. This morning we heard that Manuel would be a Tropical Storm for a while but would again dibble down to a depression by Thursday, wrong again, Manuel is now a hurricane (catagory 1) and looks to be heading straight up the Baja with a bend toward the Mexican mainland. In my estimation it still looks like it is going home to La Paz. Being in Cabo we are told to just expect rain. Cabo is the tip of the Baja for our friends in Winters. You can see for yourself what is happening and it would not surprise me to see our friend Manuel arrive with gusto here or at Squid Roe up the street. Currently we have winds that are just topping 15 MPH, so nothing really to write home about, Manuel has winds gusting over 75 MPH now and we will see how he does as he warms up to the sea. Water temps down here are near 90 degree’s so that should provide a bit of steam for him as he makes his way. We are still hoping to jump into the Pacific on Sunday but if you watch the NHS page you will notice we have another potential hurricane coming up in the next 5 days. We will wait and watch, then if the window is right, dash for the boarder. We love a fast commute, by the way, how was yours? Trouble with the wild life.